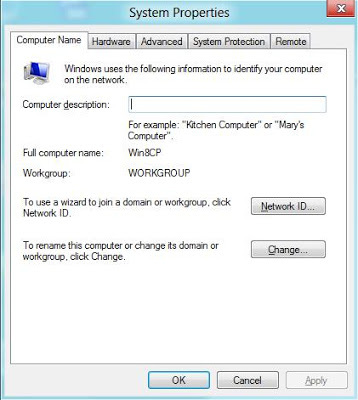 As an IT guy, I’m quite interested in how the new version of Windows is going to handle connecting to a domain. Is the interface new? Updated? are we going to see more tools? Does Windows 8 still require a reboot after joining a domain? There are a few questions I wanted to answer with this Consumer Preview version of Windows 8 I have loaded. My test environment included a Windows Server 2008 Domain Control and a Windows 8 computer. 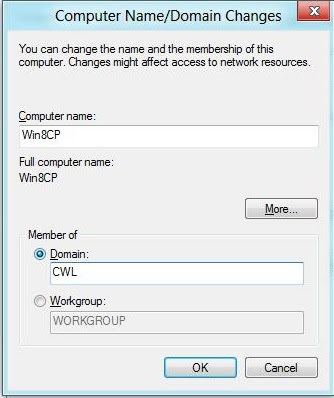 Summary: Windows 8’s Active Directory support goes under the microscope as build 8250 is joined to a domain. Well, with all the hoopla about the metro interface and the possible lack of support for domains in Windows on ARM (WOA) tablets – you might forget that Windows is also a client machine. In fact, you might have missed that the engine that makes Windows so successful is the Enterprise and manageability tools that come with Active Directory domains. Your first question is probably “What’s new?” and I have to say, “Not allot”. based on what I’ve seen, Windows 8 doesn’t really look like it will be much different than that of Windows 7 when you join a domain. Let’s take a look. So far, this is the same place as you would join a domain in Windows 7. The “Change” button is still there and really, if the theme wasn’t slightly different, you might think this was actually Windows 7. You also notice the Computer Description is still there. This screen also looks exactly the same. Not much of a difference here. I do notice that the “More Information” link has been removed, though this may be due to plans Microsoft has for a different help system. 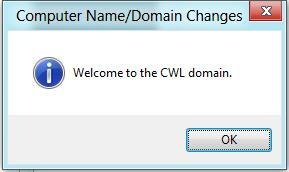 After you’ve authenticated in the domain you’ll still get this somewhat useless dialog that welcomes us to the domain. Microsoft, I really think you can do away with this process altogether now. I was curious if we’d see a version of Windows that can join a domain and not require a reboot. That would have been an impressive new feature. But, alas, we much still reboot machines after joining a domain just like we always did. I don’t see any reason for that to change in the final version. Interesting here is that Windows supports user accounts from the local Windows machine, from a a Windows Active directory and accounts that are cloud enabled with a Microsoft Account. It will be interesting to see more about how these accounts are represented on disk, how they’re linked to thy’re respective services and whether Microsoft has made plans for API (Application Programming Interface) that might let developers hook accounts and services to the shell. Imagine logging into Windows with your Gmail account and having an Android-like experience. There is some great potential here. Given the number of changes Microsoft was promoting at their recent event in Barcelona, I was expecting to see a few more differences than this. Let’s also not forget that there may be some interesting goodies in the Windows 8 Server -> Windows 8 Client scenario that I haven’t been able to test.